Remove the front door glass regulator (2). Refer to GW-16, "Removal and Installation". 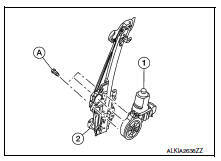 Remove the bolts (A) and the front power window motor (1).